Barack Obama swept into the White House, thanks, in part, to his political and oratorial skills. He should have learned during his campaign for the US Senate that what he says about race relations at a Southern Illinois county fair will be reported in the African American wards in Chicago. So what happened to those skills when he hosted Israeli Prime Minister Bibi Netanyahu at the White House this week? The President was determined to reassure the Israeli public. But did he pause, even for a moment, to consider how his answers would sound to that part of the Israeli public that desperately wants him to stand up to Bibi? Did he think how demeaning his answers were to Americans who want their president to be their president, and not pander to the prime minister of a foreign nation? Did he stop to think that his answers would be harmful and offensive to the Arab/Muslim world? Worse yet, did he care? Obama was interviewed by Israel’s Channel 2 network reporter Yonit Levy one day after his meeting with Netanyahu. The story of the interview appeared in the Jerusalem newspaper, Ha’aretz. “Creates suspicion?” Please, Mr. President, the name Hussein is one you have previously said you carry proudly. What purpose is there in linking “Hussein” to “suspicion”. That is Fox News talk and we know what you think of Fox News. The name Hussein “creates suspicion” only to small minded people who hate and fear Muslims. It is beneath Barack Obama to fall into that Fox News bigoted mindset by pandering to an Israeli television audience, most of whom know pandering when they see it. Ironically, I’ve got a Chief of Staff named Rahm Israel Emmanuel. My top political advisor is somebody who is a descendent of Holocaust survivors. The advisor, whom he does not name, is, of course, David Alexrod. My closeness to the Jewish American community was probably what propelled me to the US Senate. That closeness did have a lot to do with the start of your national career, Mr. President, but it is not something you brag about when you claim to be working for a “peace agreement” between Israel and the Palestinians. Barack Obama has been in this political business long enough to know that what is said on Israeli television, does not stay on Israeli television. You are not in Vegas anymore, Mr. President. Bragging about key advisors being Jewish and commenting like a political reporter about the start of your political career would not have impressed Israelis from the hard right political wing of Israeli politics. Nor were they impressed by the President of the United States pandering to the Israeli prime minister who has yet to give the President even the slightest concession in negotiations with the Palestinian leadership. Prime Minister Benjamin Netanyahu signaled on Thursday he would not extend beyond September a 10-month moratorium on new housing starts in settlements in the West Bank. “I think we’ve done enough. Let’s get on with the talks,” he said, when asked in an appearance at the Council on Foreign Relations in New York whether he would extend the limited freeze he put in place to coax the Palestinians into peace negotiations. Bibi Netanyahu does not have the slightest intention of making concessions to the Palestinians. Why should he? He has the US Congress in his back pocket. The American public remains under the sway of a decades-old Hasbara campaign that has created a false narrative that Israel is our only friend in the Middle East. That narrative has been around a long time and its grip on American consciousness is appalling. 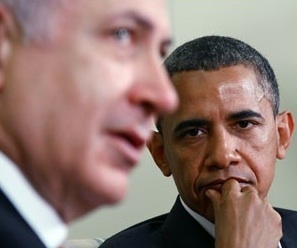 It is a narrative that should be very much in President Obama’s mind as he confronts Netanyahu’s hard line stance. Already in 1948, the Truman administration regretted the arrogance and brutality of Jewish ethnic cleansing in the Arab parts of Palestine but did nothing about it because of Cold War rivalry and fear of what Truman called the “pressure boys” of the Israeli lobby. The American media has, of course, long been under the control of Israel’s Hasbara (Hebrew for propaganda or explanation), but of late there have been signs that change may be on the way. How else to explain a surprising column written by the Washington Post‘s Dana Milbank, under the heading, Netanyahu hears no discouraging words from Obama. A blue-and-white Israeli flag hung from Blair House. Across Pennsylvania Avenue, the Stars and Stripes was in its usual place atop the White House. But to capture the real significance of Prime Minister Binyamin Netanyahu’s visit with President Obama, White House officials might have instead flown the white flag of surrender. Four months ago, the Obama administration made a politically perilous decision to condemn Israel over a controversial new settlement. The Israel lobby reared up, Netanyahu denounced the administration’s actions, Republican leaders sided with Netanyahu, and Democrats ran for cover. So on Tuesday, Obama, routed and humiliated by his Israeli counterpart, invited Netanyahu back to the White House for what might be called the Oil of Olay Summit: It was all about saving face. The president, beaming in the Oval Office with a dour Netanyahu at his side, gushed about the “extraordinary friendship between our two countries.” He performed the Full Monty of pro-Israel pandering: “The bond between the United States and Israel is unbreakable” . . .
For that small number of readers for whom “the Full Monty” might not be a familiar movie and play title which has given rise to a term now widely used, suffice it to say that not only does Milbank’s column evoke the image of surrender, he also manages to slip in a term that five years ago would never have made it past the Post’sHasbara copy desk. That my friends, is progress toward peace, real peace, not the peace going nowhere around a negotiating table, but progress toward peace that has begun to shatter the Hasbara grip on American politics. The picture above is a Wilson/Getty image, used in the Washington Post. Perhaps you saw the Larry King interview (July 7) of Netayahu. It was an insult to the viewers’ intelligence to see Larry King hand him the questions ever so gently, then give him full reign to state his tired propaganda lines. with barely any interruptions, or countering back. thanks again for keeping America informed. Once again, thanks for holding President Obama’s feet to the fire. Americans have a right to expect America to be more than an extension of Israeli foreign policy goals and objectives. I suppose the true test of the decline of the strength of AIPAC and their fellow travelers is whether any person seeking a seat in the House or the Senate can “defy” AIPAC and still be elected. The dominance of the Israeli “narrative” in the US as over against the the Palestinian “narrative” (with their legitimate aspirations) still prevails. So we chip away at it. It’s like turning a huge ocean going vessel from one diretion to the other. All the deeply held bias about “radical Islam” is part of the underpinning. And all going against those who are or want to be our “friends” among the Arab nations. It all feeds Al Quaeda recruitment. So ironic. Reinforcing the divisions instead of building bridges. Why should Likud make any substantive changes? They’ve got Obama in their back pocket. Shameful indeed. Please Mr. President, show more of your true self. More COURAGE, please! We met a couple years ago on an ICHAD tour of Ma’ale Adumim. It is quite disheartening to see Obama further kowtow to AIPAC and its minions. With the rise of Jewish dissent, mild as it may be, with groups like “J” Street and the other peace groups, not to mention Rabbi Lerner and Rabbi Waskow, I can only hope post election (ours) he’ll move the conversation again. But as Richard Curtiss once told some of us at an NGO meeting at the UN, the Democrats will never criticize Israel. Only the Republicans have ever taken them on and that sadly not since James Baker was the Sec of State. You are sounding more and more like a Robert Fisk. Bravo! President Barack “Milquetoast” Obama is wholly incapable of standing up to Netanyahu or anyone else (besides his former supporters, third world leaders without armies, navies, or air forces, or progressives). Israel’s multiple invasions of Lebanon, “incursions” into Gaza and the West Bank, the ever-expanding settlements, the vicious racism and tribalism that characterizes the present ultra-rightist government of Benjamin Netanyahu, which includes the openly racist and fascist party of the thuggish Avigdor Lieberman – the list of Israel’s sins is a long one. Look at the Palestinian News Network occasionally (http://english.pnn.ps/). Among other “gems”, note this: The Libyan aid ship bound for Gaza, loaded with 2,000 tons of food and medical supplies (rice, sugar, and olive oil) donated by Greek charities, manned by 27 volunteers is charged with “questionable and provocative” intentions. An American president should pledge to defend the rights of our most vulnerable members of our world community: the tens of thousands of prisoners of conscience around the world, those who are under occupation or under siege, the millions terrorized by dictators and war lords, the poor and the sick, the uneducated and the exploited, the children, the abused women, and the elderly. Each one of these classes of people needs a voice and an advocate. They need to gain their freedom to realize a life of dignity and peace. So whether we American citizens recognize it or not, we are at the forefront of this struggle for their freedom. Our president should let his conscience speak on their behalf. The manner with which Obama deals with AIPAC indicates that he confuses the loosely-grouped Zionist lobby with that of a Wall Street bank or corporation. How could we ever have believed he would be a President with principles?